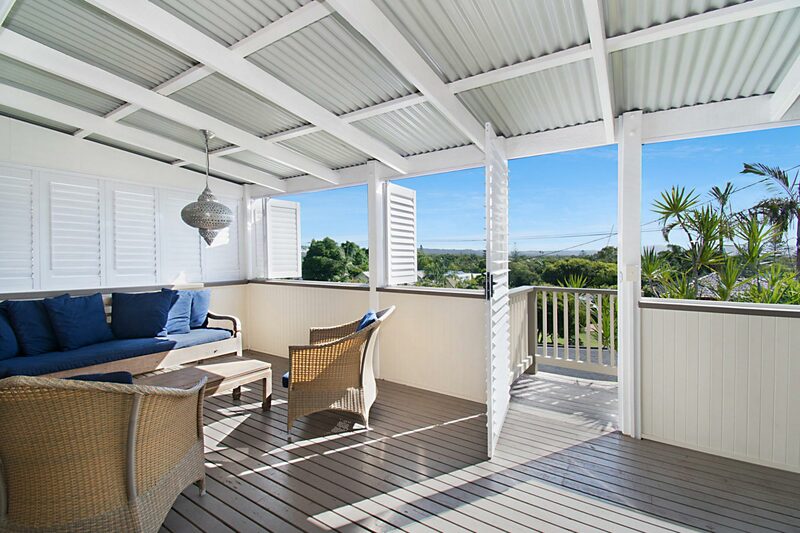 Byron View is appropriately named, offering lovely views of the lush, Byron hinterland and spectacular sunsets from its spacious, enclosed front balcony with floor-to-ceiling plantation shutters. 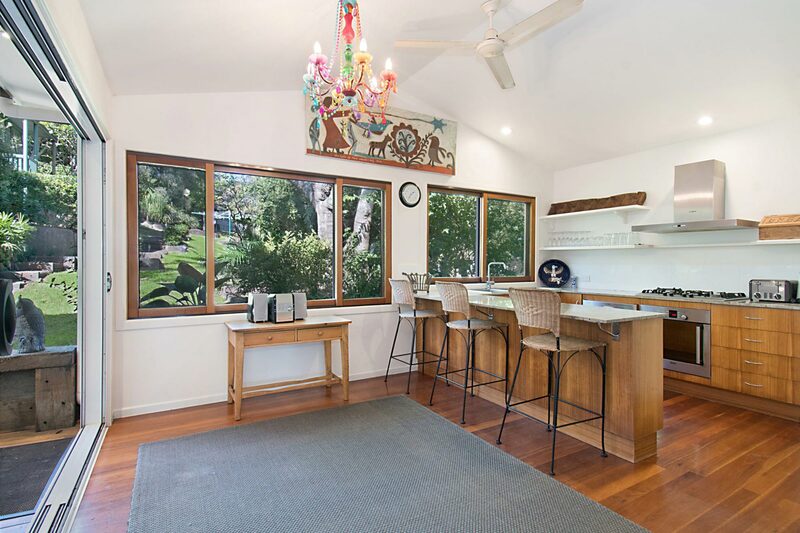 This inviting, 4 bedroom, 2 bathroom house at Clarkes Beach is a comfortable place to settle in and enjoy all that Byron Bay has to offer! Enter the living and dining space, a warm, relaxing place to get cozy around the smart TV or engage in pleasant dinner conversation at the dining table. The fully-equipped chefs kitchen has modern appliances and a charming breakfast bar with seating for 3. Stepping outside, you’ll discover an immaculate backyard retreat just behind the house. A spacious, covered deck offers ample room for lounging as well as dining, with a barbecue and prep space. The manicured lawn stretches the length of the property, with 36 metres of green space to play and enjoy. There is even a bonus surprise awaiting the kids: a secret cubby house tucked away inside the garden. 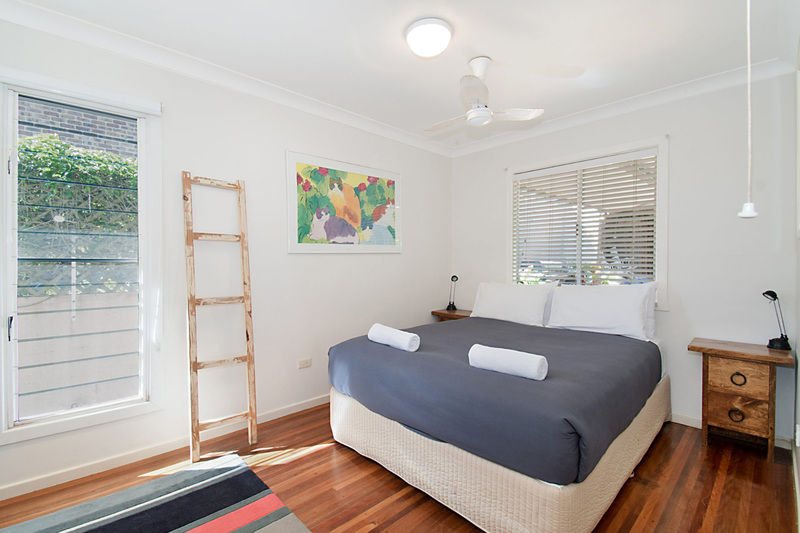 There are 3 bedrooms upstairs, 1 king and 2 queen beds, each with ceiling fan and polished timber floors. In the upstairs hallway is a shared, newly renovated bathroom with separate soaking tub, glass shower, and ample counter space. The 4th bedroom is located downstairs and is a perfect teen retreat with its own private entry and access up to the backyard. The downstairs bedroom also has its own ensuite bathroom with shower, 2 single beds, and a desk. 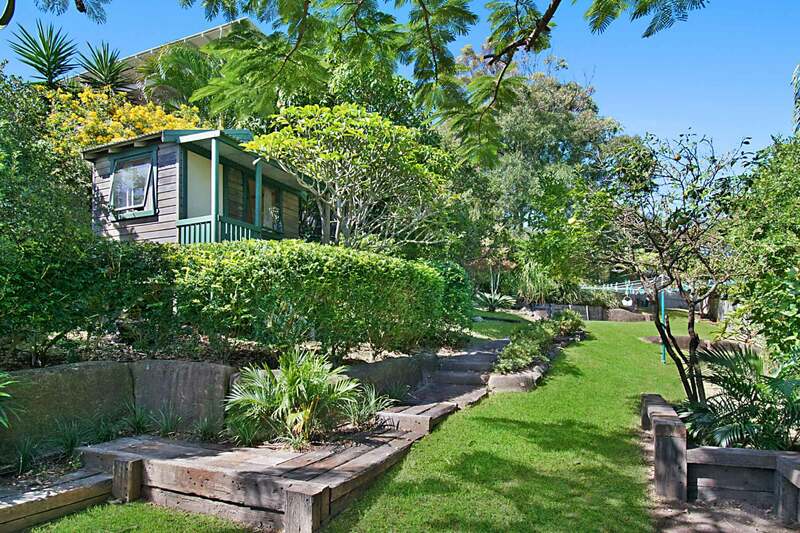 Byron View’s location is unbeatable, just minutes from Clarkes Beach and the centre of town. An added perk is the unmissable coffee at The Top Shop, one of Byron’s most popular cafés, just a stone’s throw from the house. When you enter Byron View from the front balcony, you’ll be welcomed into an open, light-filled living and dining room. 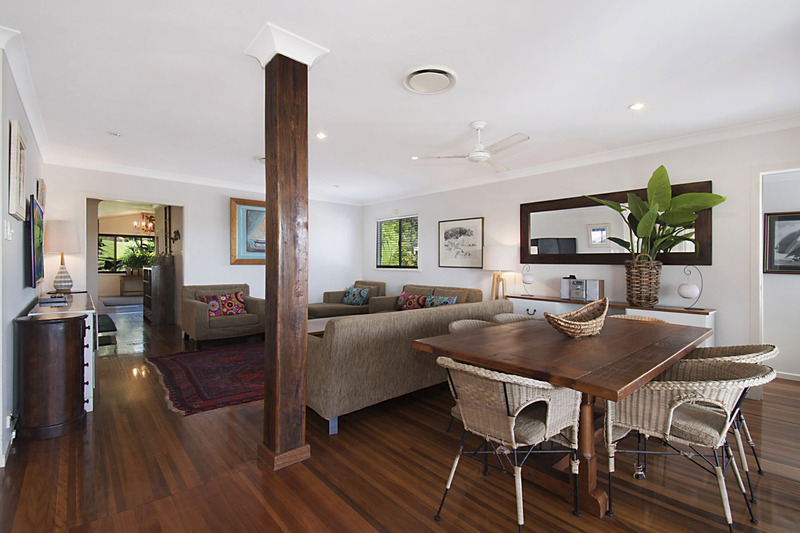 Polished, timber floors are carried throughout the space, which is comfortably decorated in warm tones fitting with the natural wood materials and earthy rattan accents. There is ample seating centered around the smart TV, while an informal dining table has space for 6 to gather over a meal. Between the living room and kitchen is a bonus area with small workspace, providing added privacy and separation when you simply must get a bit of work done! The modern, fully-equipped chefs kitchen has everything you need to whip something together from your fresh, farmers market finds. There is ample cooking and prep space on the large gas range and spacious granite countertops. The breakfast bar seats 3 comfortably, and is the perfect place to enjoy a glass of wine and conversation without leaving out the chef in the group. On the first floor are 3 of the 4 bedrooms. 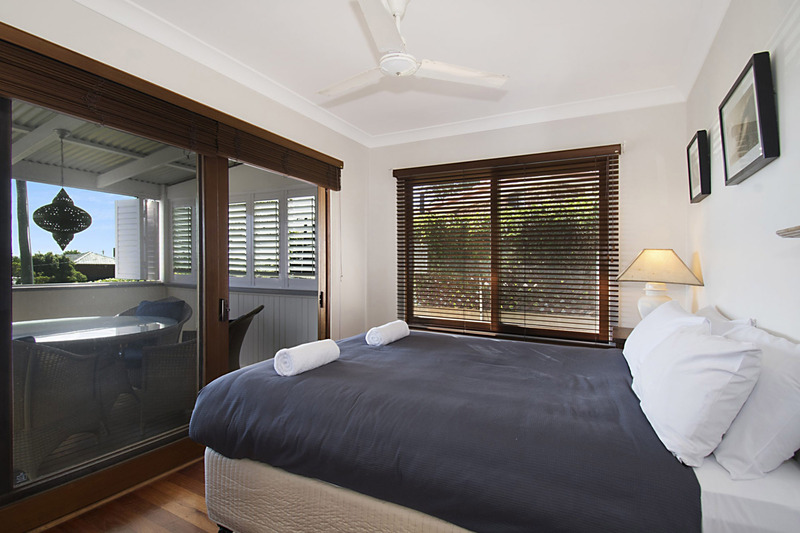 The first bedroom has a queen bed, with access to the incredible front balcony through sliding glass doors. There is a second queen bedroom down the hall and a third bedroom with king bed overlooking the backyard. 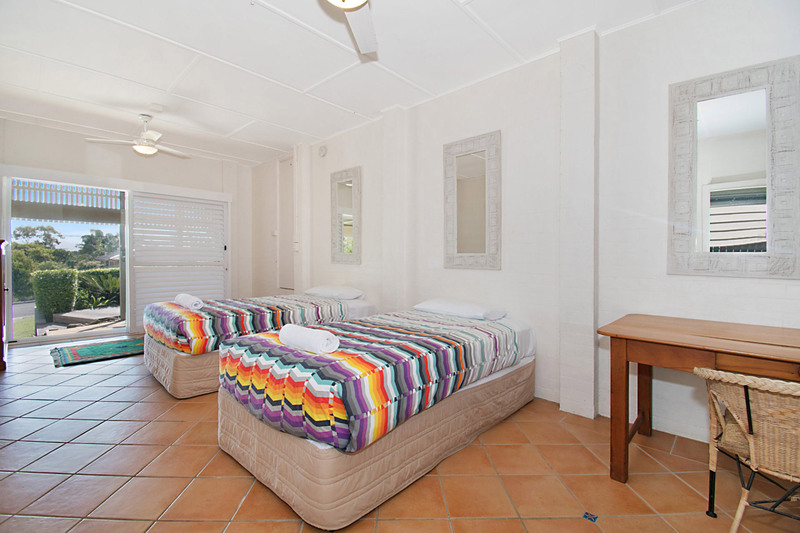 All of the upstairs bedrooms are comfortably furnished and offer large, bright windows as well as ceiling fans. There is a shared bathroom located on this floor, newly renovated, with ample counter space, a glass shower and separate soaking tub. 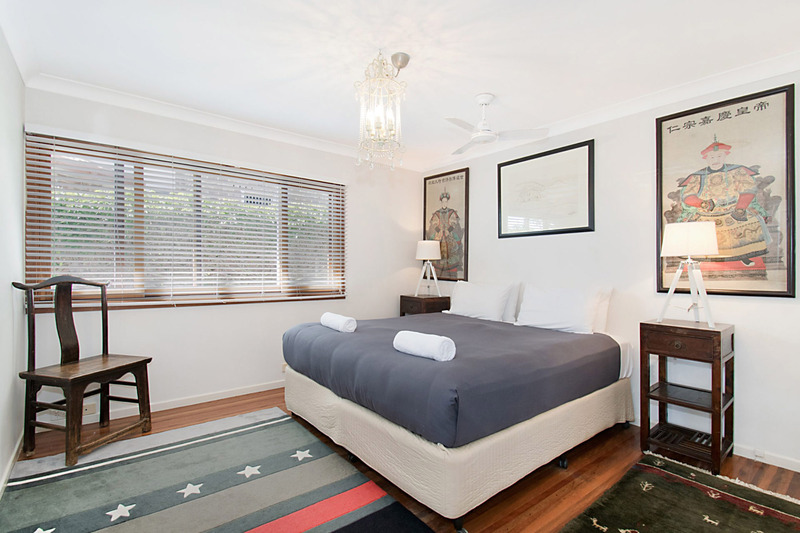 Downstairs, the fourth bedroom is a delightful retreat ideal for teenage guests with it’s own private entry. There are 2 single beds as well as a desk, with sliding glass doors that open into the backyard. 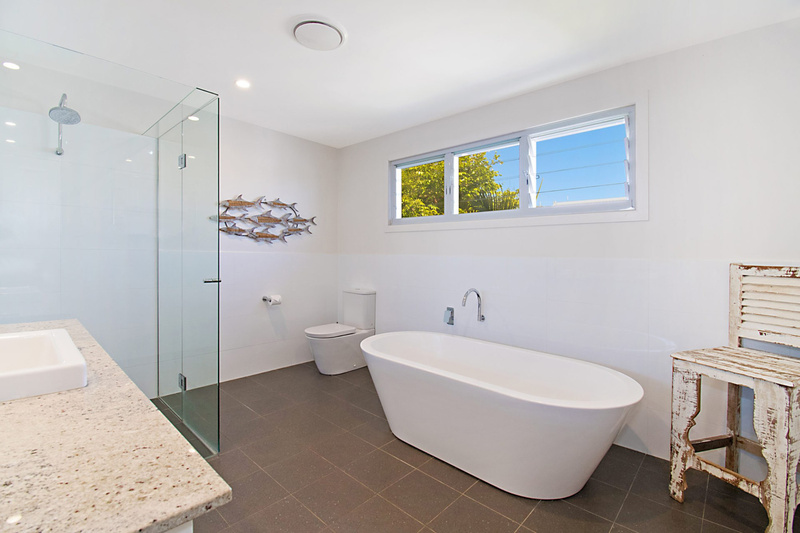 The second bathroom is an ensuite with a shower and separate toilet. The outdoor spaces at Byron View are truly top-notch, from the spacious balcony out front to the immaculate backyard and garden. 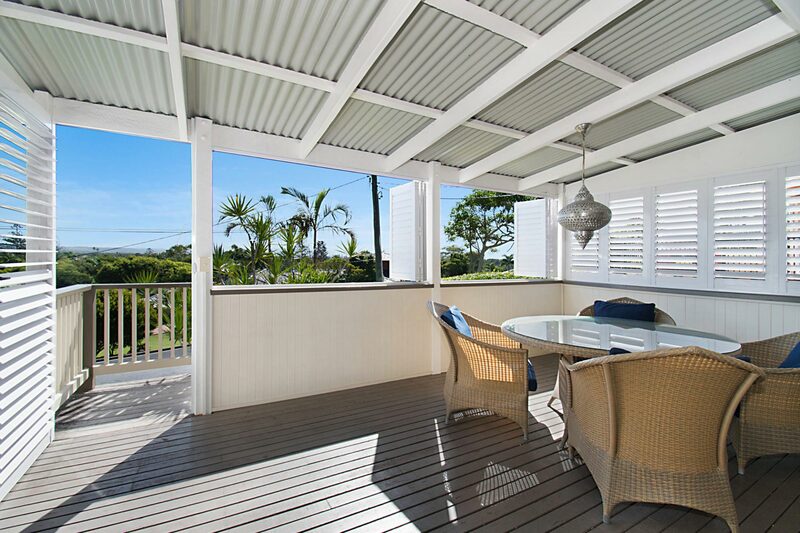 The enclosed front balcony provides an inviting welcome to the house, with plantation shutters that are best left open to admire lovely views of the Byron hinterland. This sun-drenched space is ideal for enjoying spectacular sunsets, with comfortable lounge seating as well as a table with seats for 6. Just off the kitchen is an entertainer’s dream: a huge, covered deck with separate lounge seating, a dining table for 8, and a barbecue with prep space. 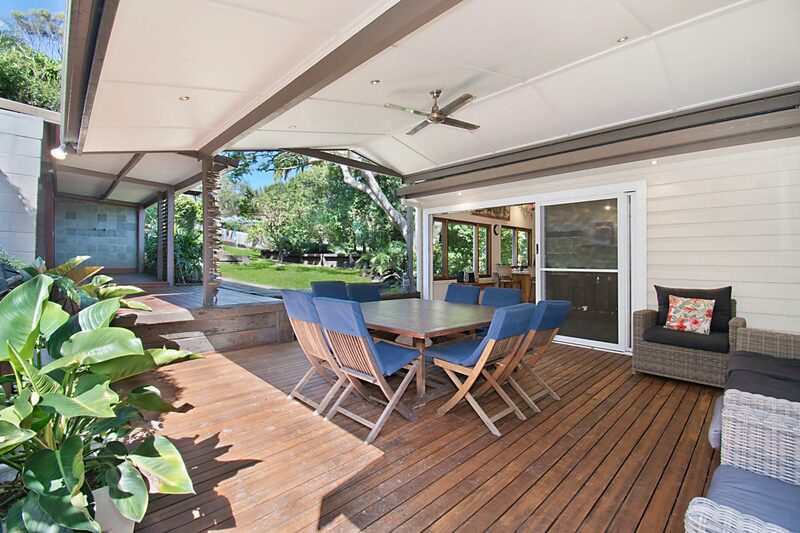 With sweeping, high ceilings and ample space to lounge and chat, the deck is a perfect place to gather and enjoy the beautiful Byron Bay weather. An expansive stretch of green, manicured lawn spans 36 metres from the deck to the end of the property. 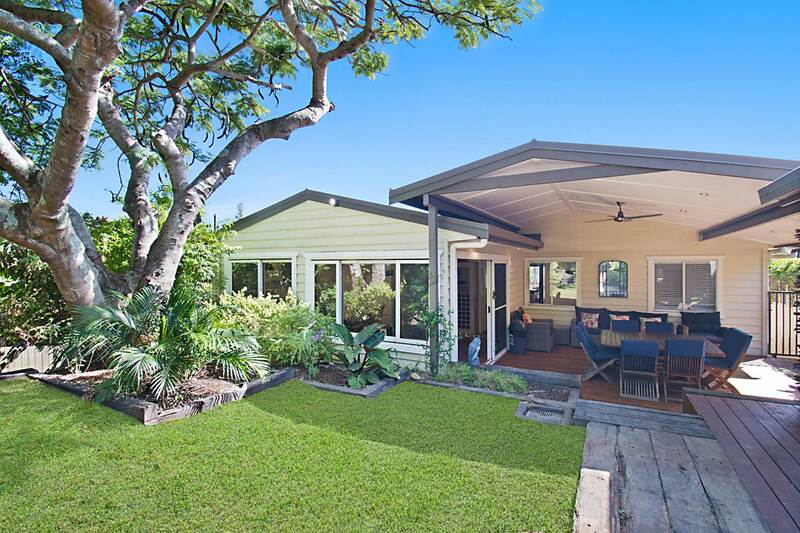 Kids will love having all that space to run and play, with an added bonus: a secret cubby house, tucked away within lush garden, practically made for a lively game of hide-and-seek. There is space for 2 cars to park, 1 in a covered carport and 1 in an uncovered driveway. From beaches and boutiques to coffee and craft cocktails, there is so much to love about Byron Bay. 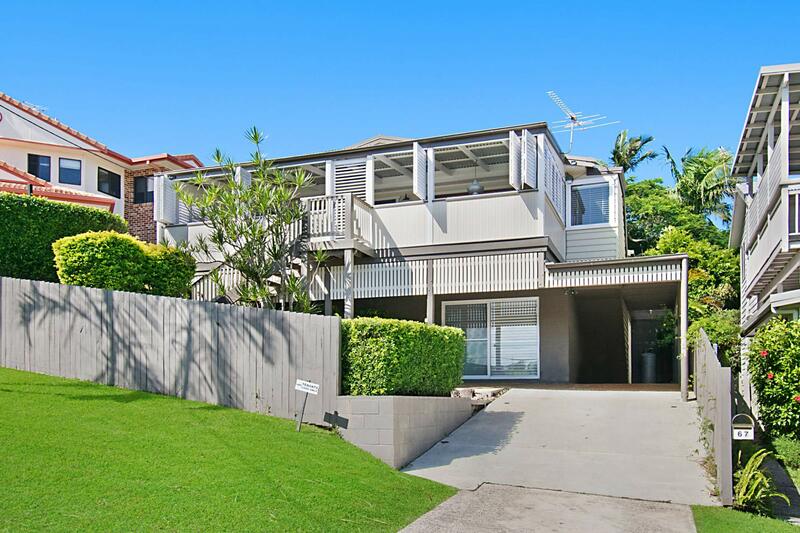 Located just minutes from Clarkes Beach, Byron View is ideally positioned within walking distance of it all. Clarkes Beach is beloved by surfers and sunbathers alike, while a short-but-scenic walk through native bushland also leads to pristine Tallows Beach. One of the most popular hangouts in Byron Bay is The Top Shop, a friendly local café widely considered the best coffee in town. The Top Shop is just down the street from Byron View, and sure to become your go-to spot, just like it is for Byron locals. 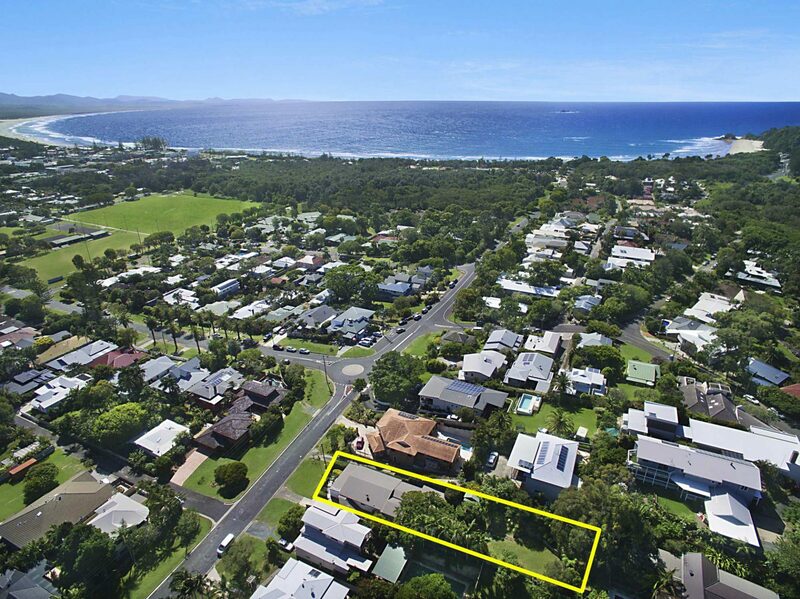 The centre of town is a short walk away, where you can enjoy Byron Bay’s best shopping, dining, and nightlife. 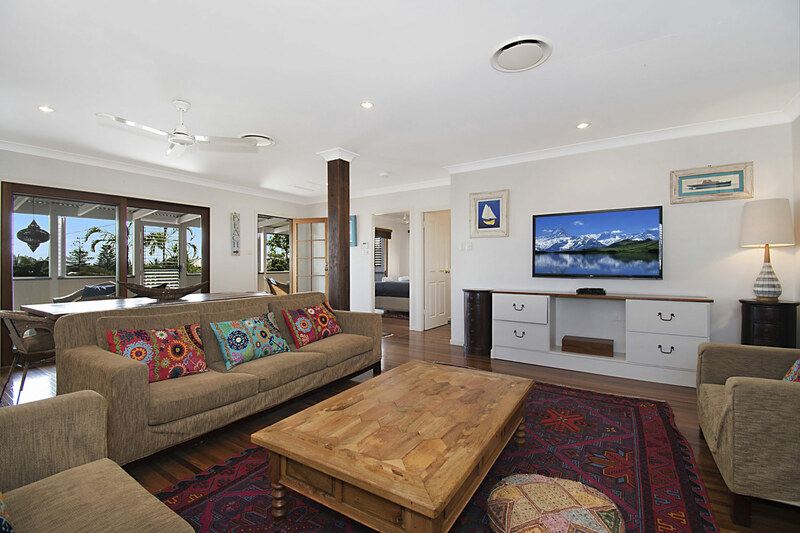 Group restrictions - maximum of 8 guests at the property unless otherwise approved directly with A Perfect Stay/Byron Bay Holiday Rentals. Wow: what a great experience. as I have lived in the northern rivers for over 25 years and having been away for 4 years I was reluctant to stay in the Bay as I have seen many changes and its busy. However, I now have a European family and as Byron is an international destination I thought Byron would be perfect and it was. what made our family holiday so fantastic was Byron View. This house was perfect for a large group of people with a constant stream of family coming and going. it had a private residence down stairs for family who just needed some privacy. it had a large back yard for the kids and a cubby house for their entertainment. the outdoor living area was superb with an area for the surfers in the family to keep their boards safe. the beds were very comfortable with a portacot available. air-conditioning if required and the lighting was just so incredibly placed throughout the property. it was private, it was connected and the location was amazing. the Top Shop across the road provided many early morning get togethers after a surf or swim at Clarkes beach which was a short stroll down the road. If family wanted more action, a short walk into Byron provided so much choice. if you wanted to head to Bangalow and Lennox you did not need to drive into the hustle and bustle of Byron. I loved everything about this house and if your looking to bring families together then this is the perfect house. Oh!! I should mention Perfect Stay were the Perfect agents. every interaction I had was positive, friendly and efficient.